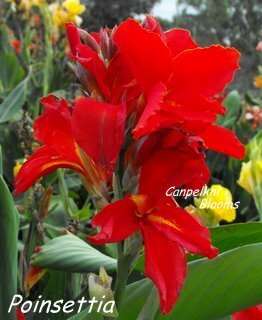 Bright Red Cannas can be a bit bold but they can also be very beautiful, here I will cover the cannas where red makes up the most of the base color. 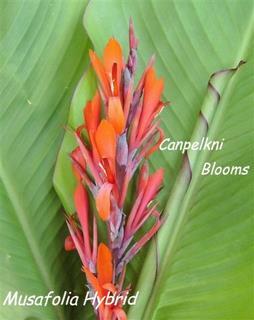 There are many canna plants with different shades of red tropical flowers some are a scarlet red, this would be the red that makes up most of my collection, other are rich red, cerise red, canna Valentine is classed as a blue red, some appear a beautiful velvety red tone and a few are classed as being dark black red. 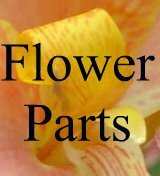 Cannas pictured below all have green foliage, the dark foliage cannas with red flowers are really outstanding with their range of dark leaves. 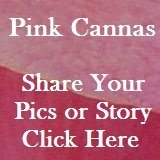 Red canna names and heights, short growing varieties are up to one meter, medium is from above one to two meters and tall cannas are listed as above two meters. 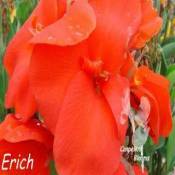 Canna Erich, medium at 1.2 meters, big round flowers. 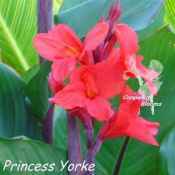 Canna Princess Yorke, medium at 1.8, cerise red flowers. 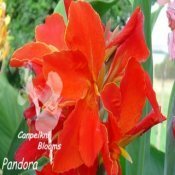 Canna Pandora, medium at 1.1, vermilion red trimmed yellow. 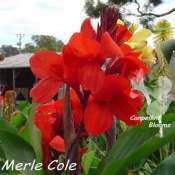 Canna Merle Cole, medium at 1.2, Australian plant. 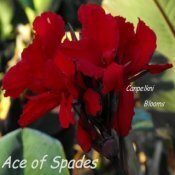 Ace of Spades, medium at 1.2, deep dark red. 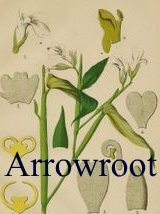 Musafolia, tall height at 2.2 meters, small slender flowers. 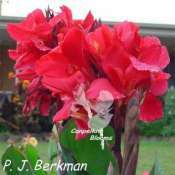 Canna P. J. Berkman, medium at 1.4 meters tall, cerise red flowers. 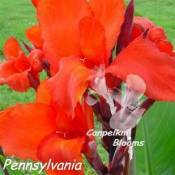 Canna Pennsylvania, medium at 1.9, scarlet red flowers. 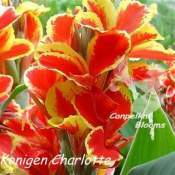 Konigen Charlotte, medium at 1.1 to 1.4, classic hot red and yellow. 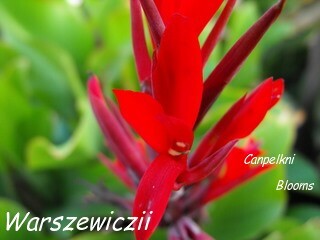 Canna Warszewiczii, medium at 1.3, species with small dark flowers. 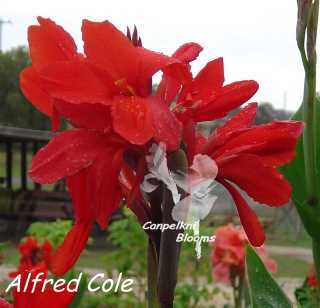 Canna Alfred Cole, medium height at 1.4 meters, Australian canna. 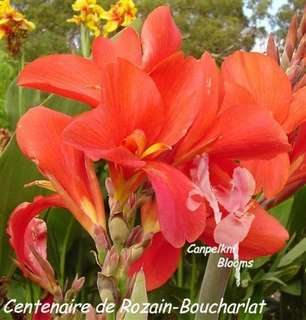 Centenaire de Rozain-Boucharlat, medium at 1.3, cerise red flushed pink. 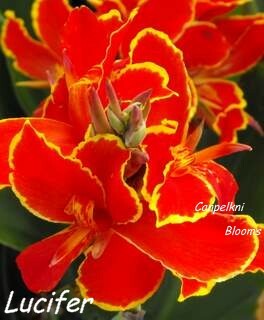 Canna Lucifer, short at 1 meter tall, scarlet red trimmed yellow. 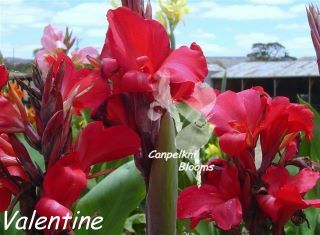 Valentine, medium at 1.2 meter, cerise flowers. 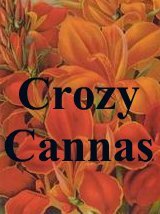 Madame Crozy, medium height, deep vermillion trimmed gold. 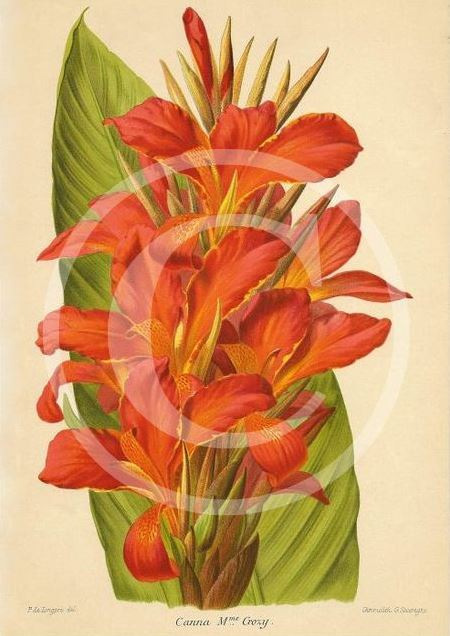 Canna Poinsettia, grows up to 1.3 meters tall, flowers trimmed irregularly with a fine thin yellow border. 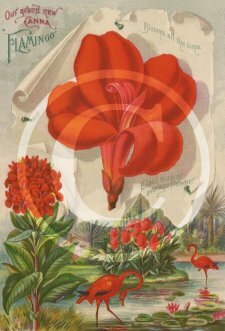 Canna Flamingo heirloom raised in 1895. 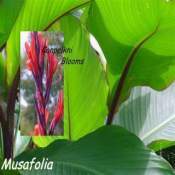 Musafolia Hybrid, medium at 1.6 meters tall, small slender scarlet red flowers. 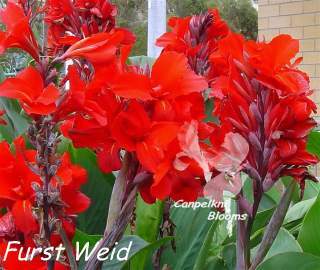 Furst Weid, medium at 1.5, red cannas with velvety flowers. 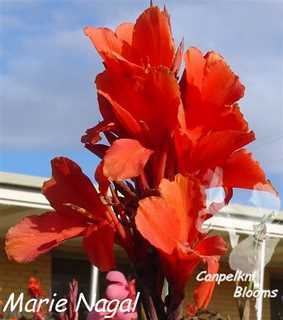 Canna Marie Nagal, medium at 1.7, vermilion red butterfly flowers. 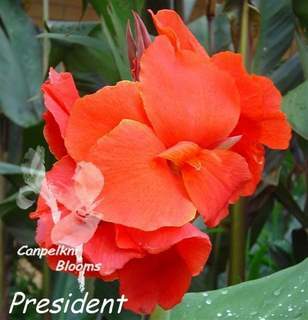 Canna President, medium height at 1.3 meters, scarlet red flowers. 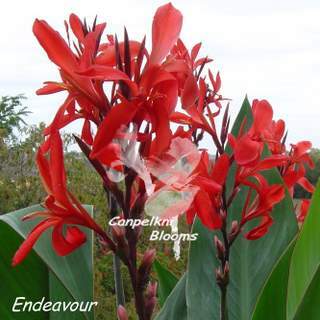 Aquatic Canna Endeavour, medium at 1.8, raspberry red flowers. 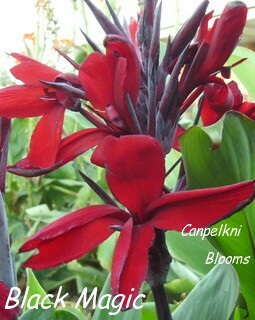 Canna Black Magic, medium at 1.2, dark red flowers from black buds.